Who can fathom the “why”? After the shooting at Sandy Hook Elementary, my spouse, Kip, pulled his high school letter jacket out of the closet and hung it on the back of his dining room chair. I think it was his quiet act of solidarity with the community he once lived in, and the school his little sister once attended. His blue and yellow jacket hanging in our dining room was a vivid symbol of how tragedy, even when it seems far away, ripples out to us all. I cannot begin to fathom the immensity of the anguish the families of the children and educators who were killed in the shooting were experiencing. I cannot imagine the nightmare images that must have continued to haunt those who witnessed the massacre. For me, the tragedy reawakened the shock and grief I felt in 1999 when a similar nightmare visited the halls and classrooms of Columbine High School, a place where I had taught briefly in the 1980’s after returning from the Peace Corps. It was so inconceivable that such an ordinary school where ordinary teenagers showed up every day and did what teenagers do — teased each other, went out for the football team, played in the band, griped about having to learn Spanish verbs conjugations — would become the scene of such senseless carnage, where SWAT teams converged, racing against time to stem the slaughter. Given these personal connections, I have felt a desire to write about what happened last week, but I have been unable. The truth is, I don’t know what to say. I could talk about the horror of these tender, innocent lives being annihilated in such a meaningless, violent way, but there is no need for me to state the obvious. I could talk about the violent nature of our culture and the danger of free access to guns, but others are speaking about that more powerfully than I ever could. I could talk about the roots of fear that give rise to our need for guns, but that would be a book, not a blog. I could talk about our deep longing for safety which we seek in different ways, some people by arming themselves, other people by wanting to do away with arms. I could talk about how safety is an illusion we cling to in this temporal life. And yet, on the spiritual plane, it is a given. To paraphrase the apostle Paul, there is nothing that can separate us from the Love from which we have arisen and to which we shall return. Nothing. Not even a mentally unstable person wielding an automatic weapon loaded with 30 rounds. It was that last sentence that got me. When there is nothing more that can be done, we open our veins. I don’t know what to say about what happened at Newtown or at Columbine. I can’t get my mind around the “why” of any of it. All I know is how I wept when I heard the news, how my heart felt so broken for the vibrant lives lost and the shattered lives of those who remain. All I know is that, in the end, what I really want from this life of mine is to find a way to stretch out my own arms and bare my own veins, to somehow offer myself for the healing of a broken, frightened world. Thank you for these grounding words in a time in which the ground itself seems to have been pulled out from underneath. Rob, thanks for taking the time to respond. As you know, it is so hard to find any words in situations like this. Peace to you. Thank you Patricia…..for sharing your beautiful thoughts and words and helping all to understand and heal and help in anyway possible. Love to you and Kip. Ginny, I’m glad the writing touched you, and thanks for sharing your response. Peace to you. My heart goes out to you and Kip, and to all those touched by this tragedy. Thanks, Dawn. While my experience of the tragedy has been from a distance, even so it affected me deeply, as I know it did millions of others. I pray that those whose lives have been shattered by this violence will find some modicum of consolation, knowing that others are grieving with them. Bah Humbug!!! Dawn Davidson (above) plagiarized my thoughts before I wrote them. She is correct – you always do say it “so powerfully & beautifully”. And yes, it IS totally outside the realm of feasibility to get one’s mind around the concept of 20 six and seven year old children, bodies riddled by multiple rounds of flesh destroying bullets. As you recall from your trip here, Danbury is very close to Newtown & many in our city had direct connections to those events of last Friday. One couple in our church has two grandchildren who attended Sandy Hook Elementary, one in Kindergarten accross the hall from where the other children were murdered and the other in third grade who actually saw the gunman. To say the grandparents were frantic would be like saying the Empire State building is a small ediface. This morning (Thusday Dec 20), a funeral service is being held in our First Church sanctuary for Lauren Rousseau, one of the adult victims of the disaster. My wife & I have a school psychologist friend from Danbury who lost 3 close friends among the adults killed at the school. So yes, I know that the magnitude of the event is being felt around the country & the world and I appreciate how many from all over are struggling in the aftermath, but southwestern CT is still grasping for ssome means to comprehend and take some “meaning” out of this. I suspect it’ll be just like when we were children & we ask our parents “Why”? and the response is “Because”! which of course provides no additional clarity to the situation. So Patricia, thank you for your thoughts and attempts to put into words what is on the minds of many. All the words you could ever summon in any order could not bring a comprehensive understanding of WHY. But thank you SO MUCH for trying – you’ve done much better than most. 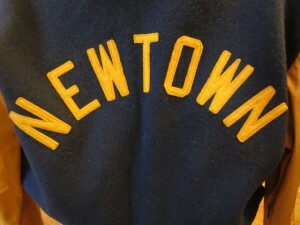 Ed, I’ve been thinking about you and your community and congregation, knowing you are just down the road from Newtown. I suspected you knew people whose lives were personally affected. Thanks for conveying something of what it’s been like for you there. My thoughts and prayers are with you all. hi patricia. thank you so much for putting your thoughts into writing. given that you didn’t feel you knew what to say, as usual, you wrote it down in a very meaningful way. i read in the newspaper a few days ago what was, for me, a pretty prophetic column on the state of this country. i am going to send you a copy. it is about the insularity of the US and the result of that on our sense of community. as always, thank you, patricia, for your beautiful words. i always feel better after i have read them, no matter what subject you are writing about. Thank you, Susan. And thanks also for sending the Philadelphia Inquirer article. It was very informative and insightful. I agree that we need to examine the wider social context that is creating the milieu for such atrocities to happen.